For Ellise and James, whose special day was held at Scarborough Hotel, having a theme wasn’t as important as attaining the right vibe. “We just wanted to keep everything really simple because that’s us, I love the brightness of wild flowers and recycled timber etc. and the pineapples were for a bit of fun,” explains the bride, who hired Audrey & Angus and Pretty Willow to help organise the day. With such a great day planned, Ellise admits that choosing a favourite moment is nearly impossible. 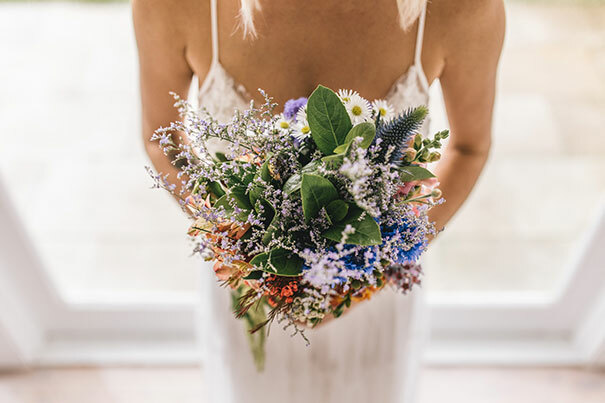 “I loved everything about the day, from the minute that I woke up and seeing the rain, to marrying James and seeing him for the first time also seeing how well our bridal party scrubbed up. But the real standout moment for me was while our first dance was happening and everybody jumped in also, when the beat kicked in to our song the entire party erupted and went crazy, I just remember standing there thinking this is the best feeling in the world,” she tells us, adding that choosing her gown was pretty easy. “The dress was Grace Loves Lace, I had followed their dresses for a while so I knew I had to go and check them out, so my mum and a couple of friends flew to Queensland for the night and went and tried some on. It was actually the last one that I tried on and one that I hadn’t actually chosen to try on at the start. It was so easy, the first and last place, and they were so helpful with all of my needs,” says Ellise, who tells us that though all of their vendors were amazing, there was one in particular that was a real star. CREDITS Photos Weddings By Tim // Bridal gown Grace Loves Lace // Robes / getting read tees For Love & Lemons and Cotton On // Bride and bridesmaids shoes Billini Shoes // Makeup Mel Riccio // Rings Tiffany & Co, Judi’s Jewellery and Cort Jewllery // Bridesmaid dresses and flower girl South Of The Border // Groom and groomsmen suits Montagio // Shoes Glue Store // Barber / grooming Barber Supreme // Groomsmen gifts Chicago Comb // Event planner / Stylist Audrey & Angus // Florist Pretty Willow // Ceremony Private property, NSW // Reception and catering Scarborough Hotel, NSW // Celebrant Greg Crowe // Cinematographer The Perfect Pair.